Vassar’s new director of safety and security, Arlene Sabo, says her profession “runs in the family.” Her father—in addition to being a high school teacher—worked summers on the Lake George boat patrol. And her brother has served in both college public safety and county law enforcement. After graduating from Castleton State College with an education degree, she cast a wide net looking for jobs, but it was SUNY Potsdam that offered her a position on the campus police force. The enthusiastic support she received from her family made accepting the offer a no-brainer. While at SUNY Potsdam, Sabo earned a master’s degree in education as well as the university’s President’s Award for excellence in service, and began cultivating a career that eventually led her to become chief of university police at SUNY Plattsburgh in 2001. She left that position to come to Vassar in September and is now hard at work on instituting best practices in policies and procedures and coordinating enhanced training for staff. The director’s skill set will certainly aid the college as it moves forward. In addition to executive police leadership certification from the FBI National Academy, Sabo was the founder and co-director of SUNY Plattsburgh’s task force on fair and impartial policing in 2014. “When I saw what was happening around the nation in regards to policing in communities—the clashes and tragedies that were happening—I knew that I didn’t want that to be happening in our communities,” Sabo said. She made sure she was present at important on-campus events, especially when the discussions delved into issues of police and community relations. “I needed to hear and have the community involved in helping to establish an action plan that was right for us. That’s sometimes where things go far awry—we lose touch with each other,” she says. In late 2014, she asked J.W. Wiley, SUNY Plattsburgh’s director of the Center for Diversity, Pluralism, and Inclusion, to co-chair the task force, created to proactively address the root causes of campus tensions around diversity issues. “We’d had conversations over controversial cases involving policing, and I knew that even if we sometimes had differences in opinion, we could work together and listen to each other,” she says. They participated in forums to educate the community about unconscious bias, the university’s policies and procedures, and the appropriate uses of technology. Wiley offered classes on these topics, classes Sabo attended as often as she could. The task force continues today, she says, and the new chief is now getting to implement much of what they planned last year. At SUNY Plattsburgh Sabo received several commendations for her sensitivity and care in the investigation of sexual assault cases. She’s using her expertise in that area to inform best practices in the department and to make Vassar’s safety and security staff more aware of the issues involved. Short-term issues may be quicker fixes and may be solved merely by examining and adjusting procedures or redeploying resources, she says, but “on larger long-term issues we’re going to form some partnerships and coalitions and work together.” She’s already partnered with Bethel Nathan, the new director of the African American, Latino/a, Asian, and Native American (ALANA) Cultural Center, who conducted diversity training with security personnel over October break, and she looks forward to collaborating with students, faculty members, and other administrators in the future. 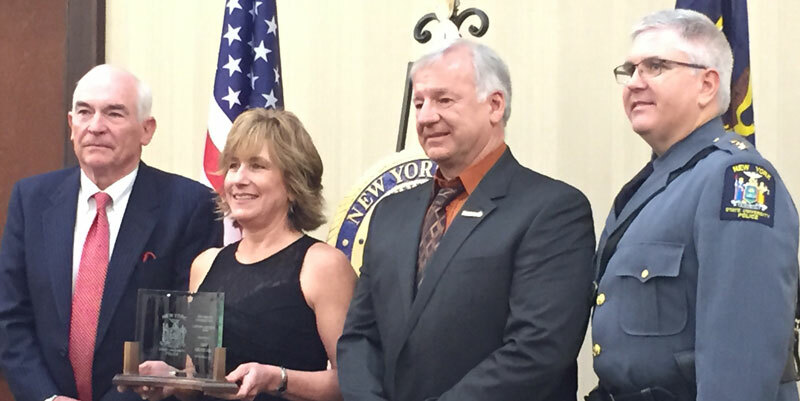 Director of Safety and Security Arlene Sabo was recently awarded the University Police Lifetime Achievement Award by the State University Police of New York.